Companies (much like singles these days) are always looking for great candidates to join their team, similar to how people are always in search of "the right one." 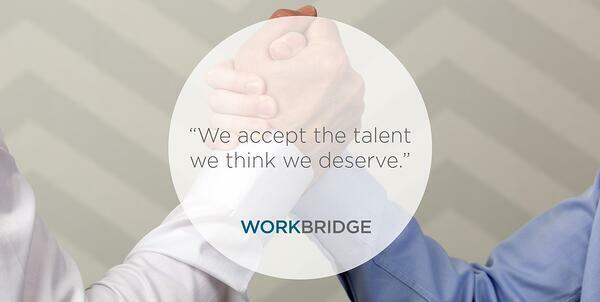 This is especially true when it comes to hiring a permanent candidate or even a short-term contractor. Whether it's on a perm or contract basis, companies can't afford to waste their time with potential candidates who are not serious about their search. The truth is 40% of employees who quit their job last year did so within six months of starting the position (via INC). So how can you avoid this? Perhaps taking your search for exceptional talent to a recruiting agency, a hiring matchmaker if you will, could be your best option for finding "the right one" to join your team. 1. Provide a pre-screening step to make sure applicants are what you see. Recruiters go through a process when verifiying candidates: they talk to them, meet with them in person, check their references, and run a background check. At Workbridge, our contractors are on a W2 and are treated as our own employees, so candidates need to be able to pass our inspection. Companies can rest easy when it comes to the quality of the candidates good matchmakers are providing. 2. Cater to compatibility so you don't waste time qualifying candidates. Every recruiter also should screen each candidate to ensure they are a fit for the role. Ideally, they would talk to the candidates about their experience and the position to ensure a match. Recruiting agencies that know what they're doing don't waste a hiring manager's time with candidates who are not a fit, and with an outside perspective can sometimes find the diamond in the rough a hiring manager might have missed. 3. Save you time, energy, and effort by doing the hard work. Recruiters are responsible for helping the candidate through the process, which includes pay rate conversations. They take on the responsibility of providing benefits information, and even supplying benefits for contractors, as well as explaining workplace insurance and background checks. They are trained and experienced to make the process of finding and bringing on the right candidate as fast as possible. 4. Find great candidates you might not find on your own. Top recruiters have a large network and diverse methods that make finding these hard-to-reach candidates possible. At Workbridge Associates, we even sponsor networking meetups through our event series, Tech in Motion, in all of our active cities. Why waste time companies combing through resumes to find "the one" (or the few)? The goal of skipping this step in the process is to give you more time to talk to qualified candidates, instead of spending that time trying to track them down. Don't go in with unrealistic expectations. Even the best recruiters still aren't miracle workers. Recruiters and hiring managers have the same goal: get your open roles filled with the best possible candidate that you can afford. It helps to have an open mind and hire the person who fits. Go into the process with a positive attitude. Looking for the candidate that fits the role, matches the company culture, and can get the job done is priority. Finding all the reasons why the person isn't perfect is not. Using an agency has its costs, even though options like contracting make it more affordable. The tech talent market is competitive, and you get what you pay for in terms of quality - whether it's a candidate or the recruiting agency you're working with. However, being up front about costs and willing to compromise could help a good recruiter find a way to work within your budget.